It would be safe to say that, smaller companies having fifty or less employees don’t typically have on-site IT personnel to manage their network usage and devices. At the same time employees have broken out of their cubicles using mobile internet connected devices such as laptops, tablets and mobile phones in new work related applications. Thanks to this dramatic increase in internet connected devices, dealers can seize the opportunity to increase sales by offering improved network infrastructure devices such as network switches, Wireless Access Points (WAPs), and upgraded network connections for their smaller commercial accounts. In small offices where there is not a central entity responsible for IT, it’s very likely that business owners have not had the chance to update their networks in some time. Small business owners are pulled in a thousand directions every minute of every day. When it comes to their networks, their thinking is most likely, “if it isn’t broke, don’t fix it,” and they may not be aware that their network functions can be greatly improved with the installation of new network devices. Take this imaginary scenario as an example. A small business owner (your client) has 15 employees, which requires at a minimum of 15 wired desktop computers, and the potential for the use of at least 15 Wi-Fi enabled devices throughout the work day. The current network switch may have the necessary port count to support the wired computers and one WAP for the Wi-Fi devices. However, if the network is using an outdated 10/100 Ethernet switch, which is common because of its low-cost, newer PCs, laptops, and smart devices will not function at their full speed and capacity because the older technology doesn’t have the capacity to keep up. A bottleneck such as this in a small office has the potential to create a costly slowdown in work production. Additionally, in this same network, if the client is using an older Wi-Fi access point that only provides 802.11 b/g connectivity with a maximum throughput of 54 Mbps, it is important to understand the network limitations, as bandwidth capability of Wi-Fi WAPs is shared among all simultaneous users. “Smart” devices and laptops purchased in the last three years are likely using only the 802.11 b/g/n or the newer “ac” standard, with a potential throughput in excess of 1000 Mbps, and cannot operate to their full bandwidth and speed potential without an upgrade. Essentially the devices are being choked by the older Wi-Fi access point, which will certainly hold up productivity at the company as well. Fortunately there are relatively easy solutions to these problems in the form of drop-in replacement products for the outmoded network equipment. A new 16 port switch will support the fifteen wired PCs with one port left for connection to a new and improved WAP. It’s best to recommend an unmanaged plug and play switch that can be installed quickly with no programming required. All that is typically needed is pulling out the old switch and plugging the existing devices into the new switch. This will easily enable the customer’s PCs to function at higher speeds, as long as the customer’s devices utilize the Gigabit Ethernet capabilities of the new switch and WAP. Each of the products detailed above generally sells for less than $200, making for a solution that is as affordable as it is effective! The minimal cost of equipment and labor makes it possible to quickly and easily modernize older commercial and residential networks, increasing sales and customer satisfaction. To effectively compete in the market, security installation companies need to consider expanding their services to include simple network equipment upgrades such as these. Your customers will thank you for improving their network performance and satisfying their needs for newest product offerings. In all cases, always look at the network cabling system for functionality and future connectivity needs prior to making a recommendation to your customer. The added satisfaction that you are looking out for their best interest will go a long way! 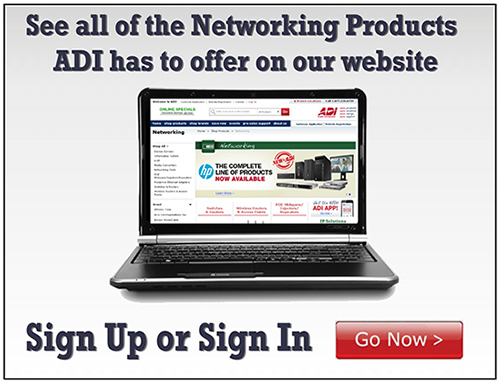 If you have questions or would like assistance with regard to network upgrades, your ADI Systems Sales and Support Group is ready, willing and able to help you at: 800-234-7971.